Earlier this month, I wrote about Morgan Stanley’s suite of Amex cards, which includes a basic no-fee card and a co-branded version of the Amex Platinum. 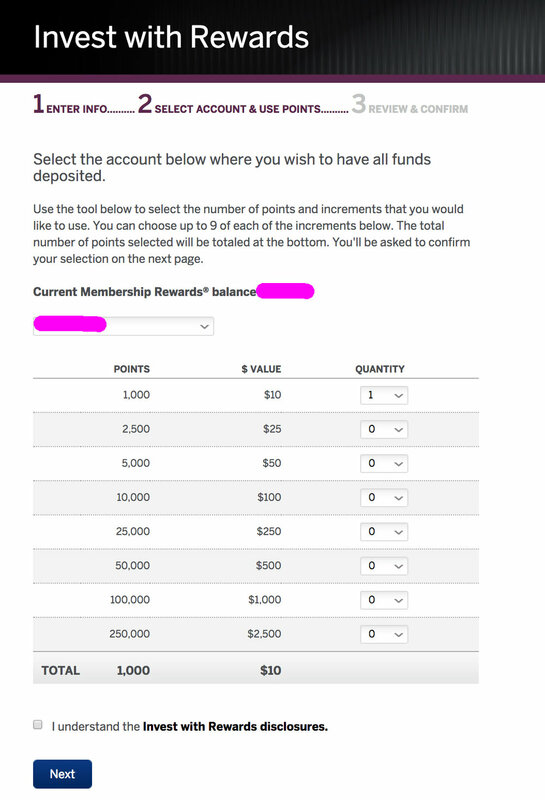 This post is a continuation of some of the topics I talked about in that post, with a focus on the “Invest with Rewards” benefit, which allows you to cash out Membership Rewards points into a brokerage account at $.01 each. You’re averse to annual fees, so you don’t want either the Charles Schwab or Morgan Stanley Amex Platinum cards. If you want to backstop your Membership Rewards balance with a cash-out option, the no-fee Morgan Stanley card is your only opportunity (since the no-fee Schwab card earns cash back, not points). It’s important for your spouse to have an Amex Platinum card too, so the free authorized user on the Morgan Stanley card saves you $175 per year. If you plan to redeem less than 70,000 points per year, you’re actually better off with Morgan Stanley’s inferior cash conversion after you factor in the authorized user fee you’d need to pay on the Schwab card. Unlike Schwab, however, cashing out points with a Morgan Stanley card is a little more convoluted. Instead of doing everything through the Membership Rewards portal, you have to go to your Morgan Stanley account and then back through Amex to get it done. It took me forever to find it in my MS dashboard, but I’ll save you the trouble: it’s under the “Services” drop-down menu. Clicking that link will take you to an Amex webpage that’s separate from your online account. After not one but two screens asking me if I was absolutely SURE I wanted to do this, I got a confirmation and the points were immediately deducted from my Amex account. The confirmation said that the funds would take 4-6 business days to show up in my Access account, but when I logged out and back in, the money was already there. And that’s it… harder than Schwab, but not that bad. It’s great to know that this feature still works with Access accounts, and that the error I kept running into the last time I tried to test this was just a random glitch. You cash out 27,500 points into $275. The market doubles, and your $275 investment is now worth $550. You spend $550 on the annual fee for a version of the Amex Platinum card you haven’t had before, effectively buying 60,000 points for $550. But you paid 27,500 points to get that $550! Which means that Amex points are worth more than twice what they’re worth. Unless you do it again and the market drops by 2/3, in which case Amex points are worth…. [head exploding gif]. Okay Frequent Miler, have at it! I’m still curious, though… would anyone ever actually cash out a meaningful amount of Membership Rewards points at a penny each, besides some dumb blogger who decides to waste 1000 points “for the content”??? Oh hey don’t forget that Patreon page!